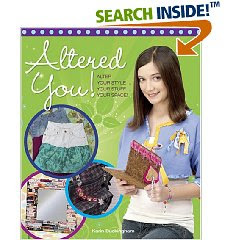 Mixed Media Artist: Book review: Altered You! Bored with that book bag? Tired of that tee? Sick of that skirt? Alter them! This book shows tween and teen girls how to alter clothing, accessories, and room decorations to create great new looks with only the simplest sewing and crafting. Projects include converting jeans to capris, changing tanks to tees, making sweatshirts into shrugs—even turning jewelry into window art. Eighteen projects are shown before and after, with easy instructions and step-by-step photos. Basic sewing directions, supply lists, resources, and more make this the book that magically transforms dull old stuff into dazzling new stuff! In about 20 seconds, I made these adorable buttonhole snaps. You can wear them snapped through strands of your hair too. 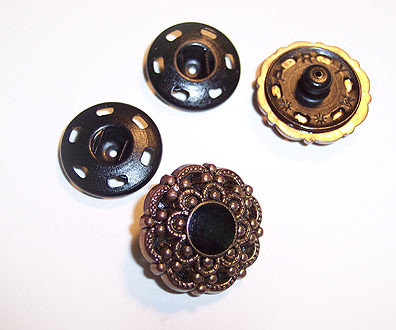 Two-part epoxy adhesive, oversized snaps, and buttons with shanks snipped off. That’s it! Thanks for the book review! I love the elegant snaps you made. Iwear a similar one through the top button hole of a casual jacket. 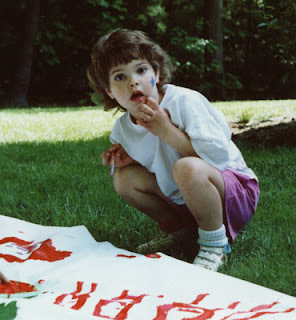 Love your blog, too!